At the very western bottom of Quayhill, overlooking both the river as well as the House of the Raven Queen, stands The Careless Wanderer, a place where travellers, minstrels, free-thinkers and adventurers come to eat, drink and lay down their heads to rest. The first floor of the building is built out of limestone masonry, while the top two floors is half-timbered, with dark wood impregnated with oils and light plaster. A fresco of a travelling minstrel carrying a knapsack and a lute is painted above the door with “The Careless Wanderer” written below in elegant script. The roof is slightly sloped with red clay shingles that have become popular throughout Kingsport. Before its opening as an inn, The Careless Wanderer was a spacious merchant’s house to a large family. The house was sold and the family moved away to Tiverton. They left behind a very well maintained building that they obviously were very proud of. Throughout the different rooms in the building there are paintings and portraits of some of the original family members, giving the entirely place a cozy and inviting atmosphere. It has a large common room with a bar, tables, chairs and benches, a small podium, and two fireplaces, one free standing one in the middle of the room, and one along the eastern outer wall. Lauryn is Aen Cannel, and runs the tavern, together with Durham, a dwarven brewmaster from Ard Thoradun. Lauryn keeps control of the room, while Durham pours the drinks. Several large barrels of ale are set behind the bar and Durham makes it a point to be the first to tap the barrel with a spigot and have the first sample, “to make sure the ale didn’t go off”. There is a trap door which leads to a cellar behind the bar as well. The cellar is connected to a small lower pier on the river. The kitchen offers food ranging from modest to luxurious, and the chef, a gruff man named Ramsey, prides himself on his creations. He makes sure that everything is made exactly right. He spends most of the morning shopping for the best ingredients in Southside. Fish, sausages, leek, tomatoes, barley, radishes, mutton, spices. 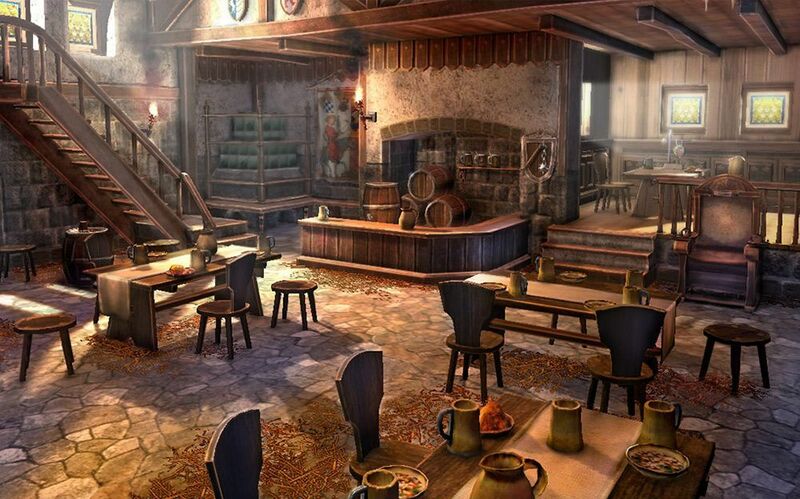 He also makes sure that the tavern stocks some of the finest Beauclair wines and is very familiar with Célestes, who provides half the city with wines. The kitchen leads out onto a tiny courtyard where Ramsey smokes his pipe while waiting for his stew to settle. This is also where the stables are housed and where he chats with his best friend, Wojciech. It has stables at the back, with enough room for half a dozen horses. For a few pennies the horses can be stabled, fed and rubbed down. Due to a lack of stable space often the horses have to be brought all the way across Steward Square to The Bridle. 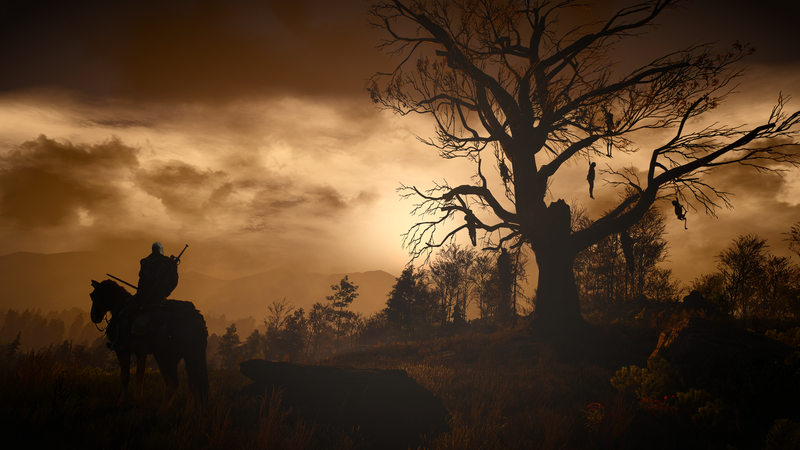 The stables are run by Wojciech, a middle-aged Silesian man who arrived in Kingsport a decade ago and has been working as a handyman and stablemaster at the inn since his arrival. Wojciech and Durham have been experimenting in the basement with several types of strong liquor made from fruits and fermented potatoes. The upstairs provides a dozen beds in the common room for a silver stag a night. There are six small, single rooms with a table, chair, bed and a small closet, which can be rented for a gold crown per night. There are three luxurious rooms with ample space, a four poster double bed, lavish interior and room for at least four other people. The luxury rooms can be rented for four gold crowns a night for the room overlooking the stables, five gold crowns for the room with a modest balcony overlooking the House of the Raven Queen, or six gold crowns for the room with a spacious balcony overlooking the river. Baths can be drawn for a small price. Cold baths are eight pennies, while heated baths are two silver stags. The tubs are set out just on the lower pier, and water is drawn from the river. This is also where clothing is cleaned, which can be done for four pennies for an entire outfit. The owner of The Careless Wanderer lives on the top floor and rarely comes down to sit among the visitors in the evenings. Her name is Magda, an elderly lady with grey hair tied in a neat bun. She is blind and either wear a veil or a blindfold over her eyes. She is remarkably spry for her age, but has been enjoying the solitude of the attic more and more over the last couple of years. While she doesn’t come down in the evenings, she’s often downstairs during the day when there are fewer visitors. She maintains warm relations with the people who work for her. She has left the day to day to Lauryn but occasionally will help out tidying up. Even though she has lost her sight, she seems to have a remarkable way of navigating the tavern, even when there are people about. Several rumour are told about how Magda lost her eyes decades before while adventuring in the Elder Foothills. The most popular of is that while she explored the ruins of an ancient elven city, she stumbled upon a basilisk and gazed into its eyes. Rather than turning to stone she gouged her own eyes out before the petrification could take hold. Another often heard story is that when she was near death after she was shot with several arrows from an orc raiding party while being chased through the hills. Terrified that she would be found, she prayed and pleaded for her life. She promised that she would give up her adventuring days, that she would give anything to retire to the city and open a tavern and tend to the needs of others. Suddenly her vision turned dark and the only thing she could hear were the snarls and screams from the orcs who had been closing in on her. Something or someone answered her pleas and took her eyes as payment.